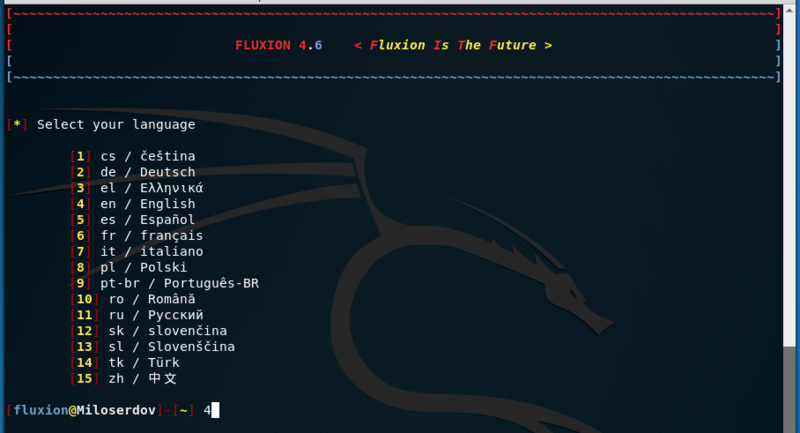 Fluxion is a security auditing and social-engineering research tool. It is a remake of linset by vk496 with (hopefully) less bugs and more functionality. 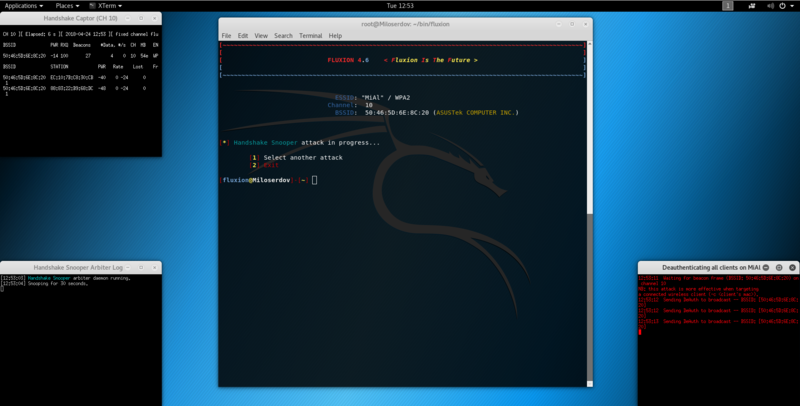 The script attempts to retrieve the WPA/WPA2 key from a target access point by means of a social engineering (phishing) attack. It's compatible with the latest release of Kali (rolling). Fluxion's attacks' setup is mostly manual, but experimental auto-mode handles some of the attacks' setup parameters. The advantage of this approach is that it does not require a long-time brute-force on a powerful hardware. The downside is social engineering attacks work not every time. Spawns a jammer, deauthenticating all clients from original AP and luring them to the rogue AP. Note that we did not manually install the dependencies of Fluxion, because the first time you run the program, it will check the missing dependencies and install them. 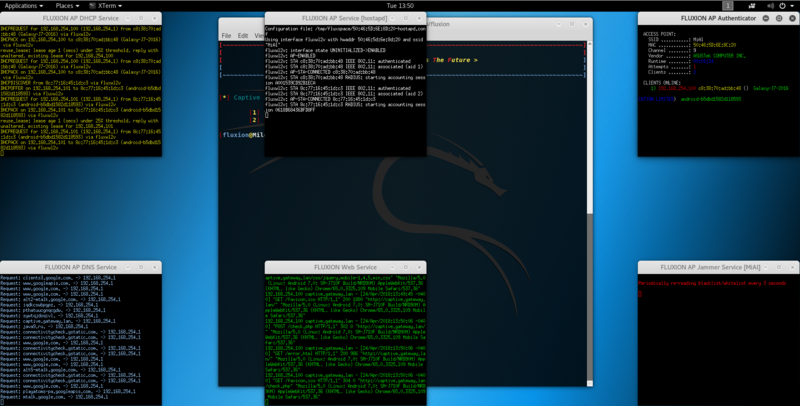 About installation in Ubuntu and its derived distributions, see the article ‘How to install Fluxion in Linux Mint or Ubuntu’. The program has an automatic mode, but it is rather experimental. The program has interactive text menu. 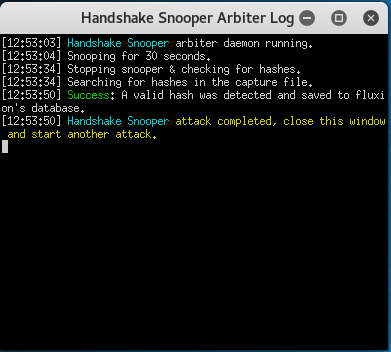 Handshake Snopper Acquires WPA/WPA2 encryption hashes. Five seconds after the target AP appears, close the FLUXION Scanner (ctrl+c). When entering the number of an access point, which we will attack, DO NOT enter leading zeros. Select an interface for target tracking. A passive method of attack forces the radio to go completely silent, making the attack subtle (undetectable), and allowing for better listening. This method should work best for situations where the target is far away. The downside is the fact the radio must keep listening until someone connects to the target access point, which could take a very long time. 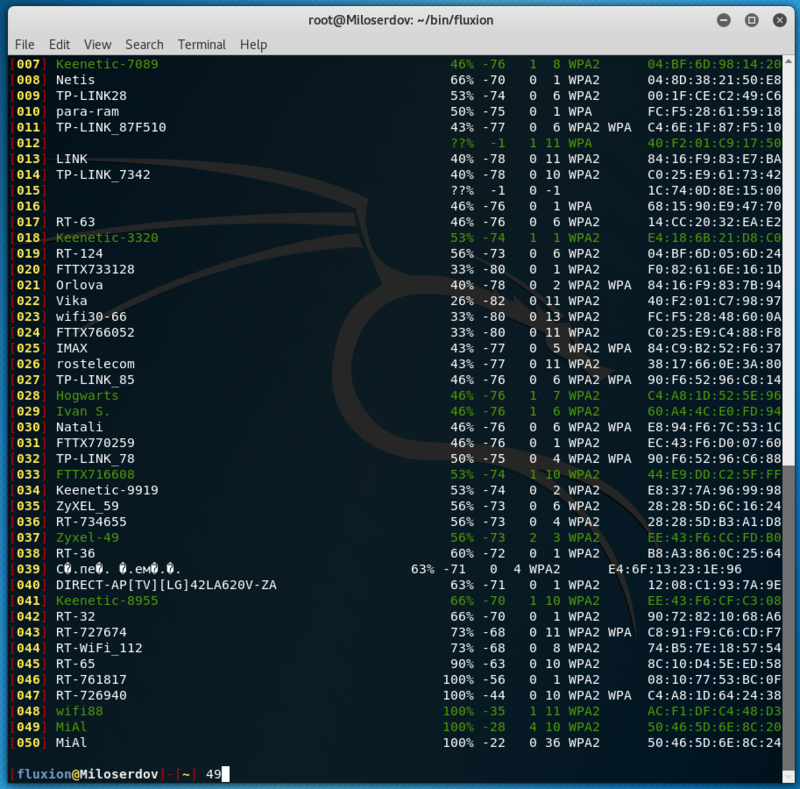 An aggressive method of attack uses a deauthenticator, either aireplay-ng or mdk3, and sends deauthentication packets to the target access point's clients. This method is considered aggressive because it is essentially jamming the connection between the target access point and its clients, effectively cutting the connection between the two. Once the connection has been broken, some devices will automatically attempt to reconnect, sending a 4-way handshake which fluxion's radio could catch. This method could be considered illegal. Make sure to follow governing laws applying to you. We're not liable for your irresponsibility. How often should the verifier check for a handshake? This sets how verification occurs in relation to capturing data, either simultaneously (asynchronously), or back-to-back (synchronously). The asynchronous option will run the verifier while the computer is still capturing data. This could cause an issue in slow systems, because pyrit … stripLive might be interrupted by the captor overwriting data too early. The probability of encountering that problem increases over time, since more data needs to be examined by pyrit … stripLive. I suggest avoiding this if possible, or to limit its use to places were the handshake file will be caught relatively quickly. The synchronous option will halt data capturing before attempting to check for a handshake, to prevent the issues described before. The downside of this method is the fact it'll stop listening while checking for handshakes, meaning it could miss a handshake while checking for one. Now go to the Captive Portal attack. Many of the wireless adapters used in penetration testing support the addition of a virtual wireless interface. This interface can be in monitor mode or in AP mode. Due to this possibility, when creating a fake access point and simultaneously jamming a real access point, you can use one single Wi-Fi card. And Fluxion knows how to do it. 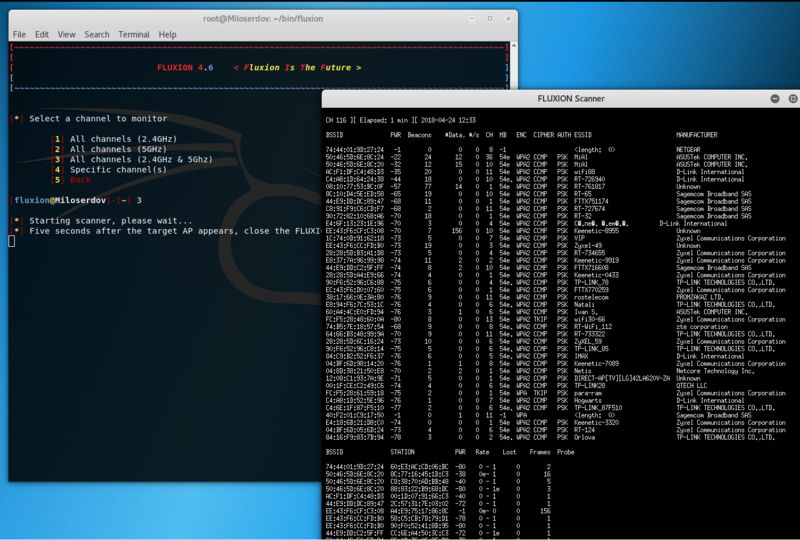 But since the fourth version, Fluxion has added one more function - to follow the attacked access point. The problem is that some access points, when a deauthentication attack is conducted against them, change the channel on which they operate. As a result, they become immune to our attack, you have to stop Fluxion, re-select the target and launch the attack again. 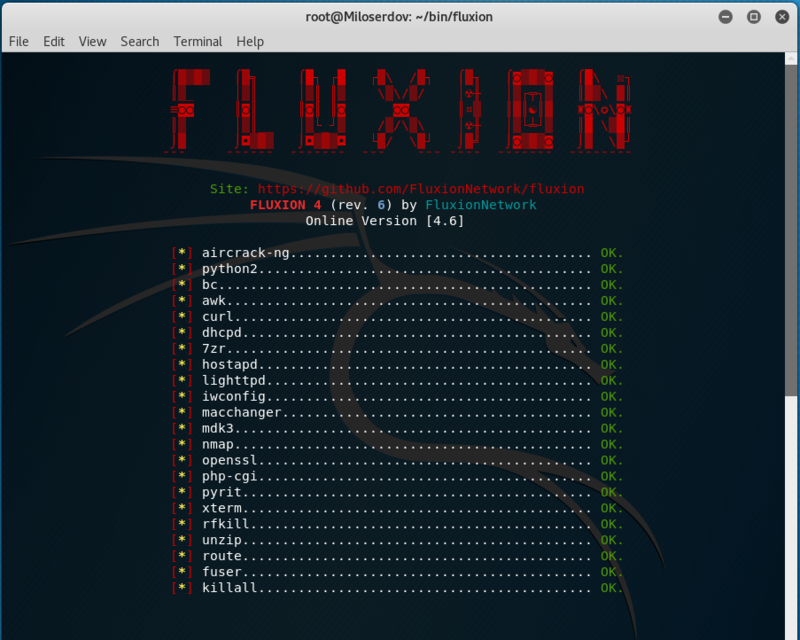 The essence of the new function is that Fluxion regularly checks which channel the access point is operating on, and if it changes the channel, Fluxion automatically restarts the attack on the correct channel. So, if you want to use the pursuit function, then you need a second wireless card, which supports monitor mode. If you do not have one, you can skip using this function. Captive Portal Creates an "evil twin" access point. When prompted, select an SSL certificate source for the captive portal, or select to disable SSL. SSL is a method of encryption used to establish a secure connection between two points. In this case, the two points are the captive portal’s web server, and the target client. If you've got a personal certificate, you must save it at fluxion/attacks/Captive Portal/certificate/server.pem and the attack will automatically detect it and auto-select it. If you don't have a personal certificate, you may select to automatically generate one. The downside is that the certificate, having been created by a random individual, will not be trusted by any device, which will likely trigger warnings for clients attempting a secure connection to the captive portal. If you would rather not bother with SSL, you can choose to disable it. Once disabled, the captive portal’s web server will only accept unencrypted connections, which exposes the information clients send to fluxion. This can be particularly unsafe if someone’s spying on network traffic. This might also trigger warnings for some clients, since the browser will need to send forms over an unencrypted connection. In my opinion, in nowadays realities it is better to use SSL, since majority of web sites using HTTPS, and more likely that a user selects using an unsafe protocol than wait for a chance that he will try to open a site using HTTP. Select an internet connectivity type for the rogue network. 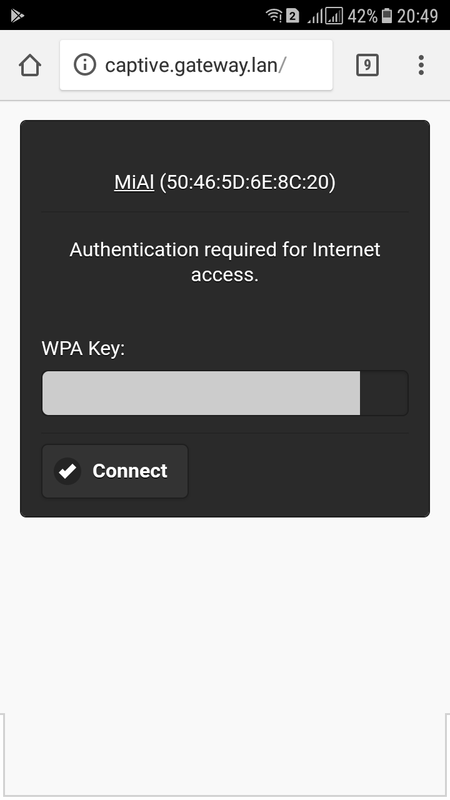 When prompted, select wheather the captive portal web server should attempt emulating an internet connection. This option only affects iOS clients, and some Android clients. This could be useful for people that don’t want to make the captive portal obvious. The clients will connect, but will be fooled into believing internet access is available. This will cause all iOS clients, and some Android clients to not show the captive portal immediately upon connecting to the rogue network, however, the captive portal will still show up once the clients try accessing any web site. Warning: This could cause clients to hang while trying to load sites, including iOS clients. The issue occurs when this option is selected, and SSL is disabled. The cause is clients attempting to access an SSL capable site, such as google.com, but hanging while waiting for a connection from the captive portal’s web server. The hanging is caused by the clients believing there’s internet access, but no responses received for SSL enabled sites. Now the attack starts, many windows will open. If the password is correct, then it is shown to the attacker, and the attack ceases immediately. 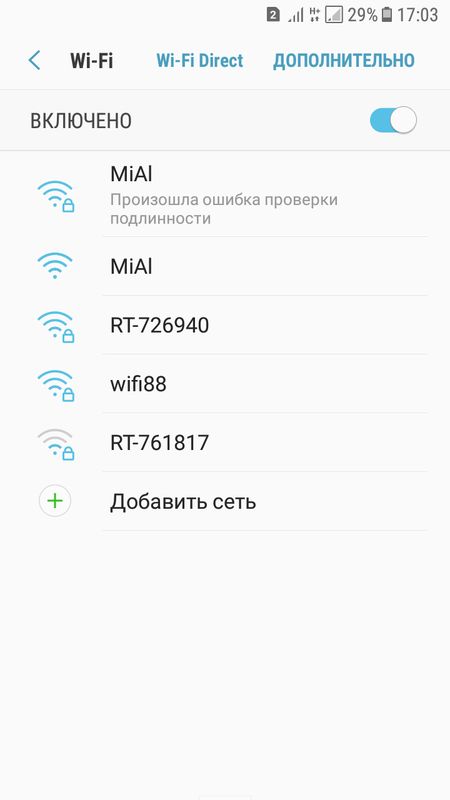 After that, the client (victim) device will automatically connect to the original access point and he will receive his normal Internet connection. It is not necessary to download them all, you can download some manually, after that place them in the fluxion/attacks/Captive Portal/sites/ folder. You need to know HTML and understand how data is sent via web forms. This is a social engineering attack and it's pointless to drag clients in automatically. The script relies on the fact that users are present in order to connect to the fake accesspoint and enter the wireless credentials. There shouldn't be one. All of the traffic is being sinkholed to the built in captive portal via a fake DNS responder in order to capture the credentials. The Captive Portal doesn't show up on my devices! The clients recognized that the fake ap has no internet connection and use their cellular data instead. If this is fixable depends on what is causing it. Check Issue # for reference. Is my wifi card compatible? The important ones are AP and monitor if one of those is missing your wifi card is most likely incompatible. If you are looking for advice on which card to buy, check below. The most common cause for this is using a driver that does not support virtual interfaces. 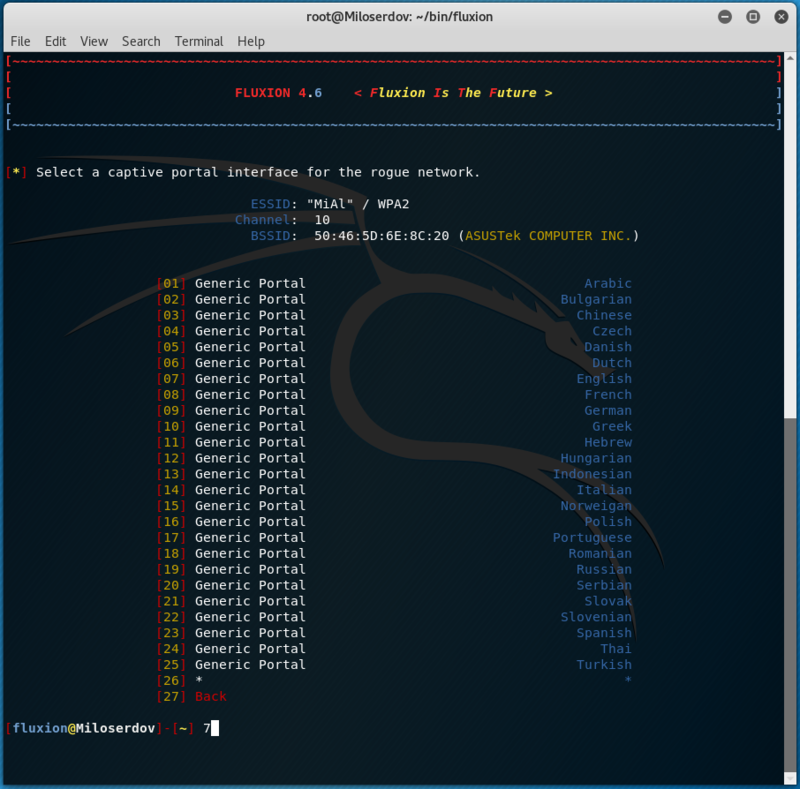 Fluxion's Captive Portal attack may use a virtual interface to simulate a secondary wireless adapter, one is used for jamming the target access point, while the other is used for generating the "evil twin" access point. The realtek-rtl88xxau-dkms is a relatively popular driver that does not support virtual interfaces. This is how the script works. The fake captive portal is set up by the script itself to collect the credentials. Don't freak, it's all okay. The MAC address of the fake access point differs by one octet from the original in order to prevent fluxion de-authenticating clients from itself during the session. Why are all my interfaces purple/negative (-)? Interfaces with a negation symbol are currently being used by other processes. What if I want to run fluxion with multiple flags? Where is the temporary folder? 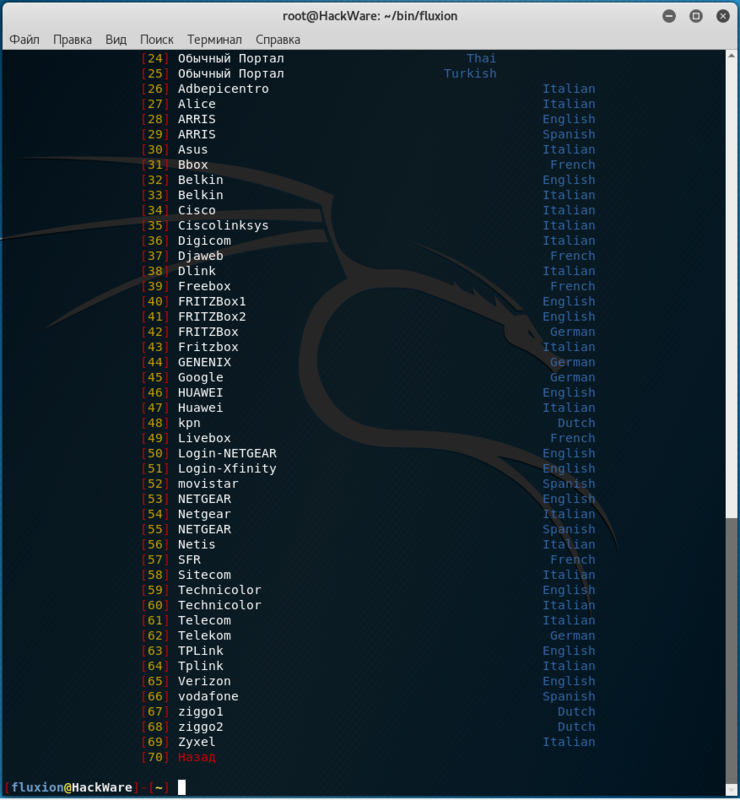 This directory only exists WHILE fluxion is actually running an attack. It will be cleaned up during the exit routine of fluxion unless debug mode is turned on. Which wireless card should I buy? It's required you use network adapters supporting master (access point) mode. If you don't currently own an adapter, you can select any from this list. It dont force client to connect wirh fake ap. I have wasted my 4 hours but no client connected with my fake ap. And they were using their own ap. i have a problem the clients of my target are not disconnected from their access point (my target) they continue to have access to internet normaly. the evil access point if created but the access to the real one is steal their. what can i do. Thanks advance. if I am getting a constant message in FLUXION AP Jammer Service: "read failed: Network is down", is that a normal thing? Excellet tutorial - I found it very informative. everything works. the only problem is that attack logs wrong password attempt and stops. 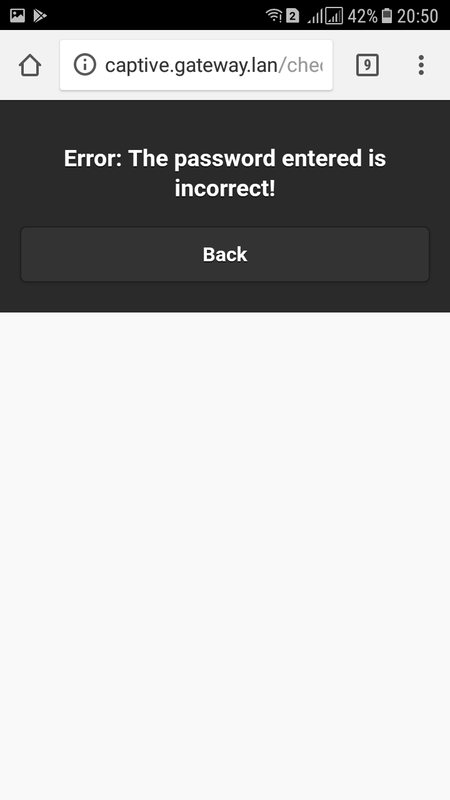 So the whole exercise is futile if the first attempt is not correct.